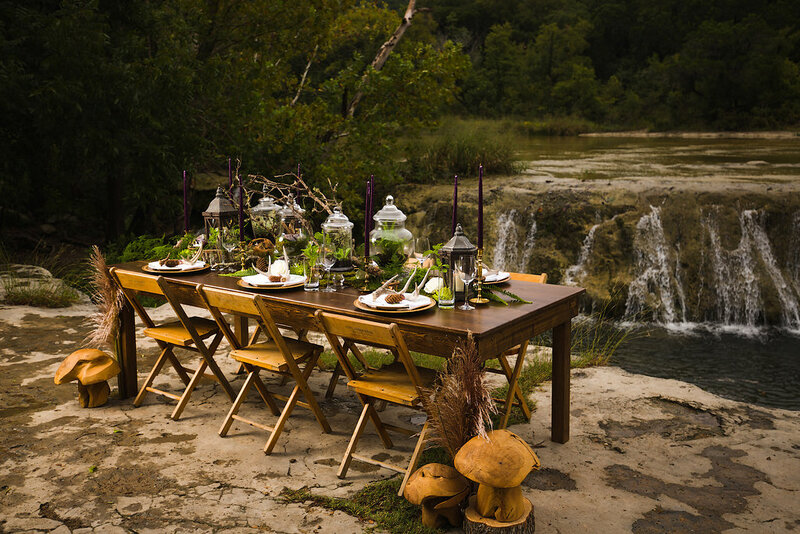 We are so excited to see our tables and chairs featured in the newly released winter/spring ’17 issue of Texas’ first LGBTQ wedding magazine, Love Wins Texas! Solrun from Electric Purple events told us about her idea for creating a “whimsical forest” vibe. When Solrun from Electric Purple Events told us about her idea for a “Whimsical Forest” styled shoot, we had no clue she had something this cool in mind. And the prospect of being published in a magazine that we respect so much was enough to get us on board. While hauling our Harvest Table and Old Pal chairs down a rocky path down to the waterfall (and nearly twisting an ankle), we were wondering what we got ourselves into. But then we started seeing the incredibly beautiful and inventive pieces Cathy and Sandy from Epic Event Design started pulling out of their bags. These ladies are MAGIC. And were it not for Mike Reed‘s stunning images, this scene might have only been enjoyed by the hobbits. Please read the full feature here and be sure pick up a copy of the beautifully designed Love Wins Texas.